Sage infusion strengthens gums and treats periodontal disease, if you gargle with it regularly. Sage is an antiseptic, skin-soothing herb with a special affinity for the tissues of the mouth and throat. Gargle with sage infusion twice a day all winter long to prevent colds and flu and to prevent/treat mouth sores. Do it after brushing teeth, not before. It doesn’t taste great, but it’s not meant to be swallowed, only gargled or applied topically. I recommend buying a big bunch of fresh sage and hanging it up to dry by the stems, in small bunches. It’ll be cheaper and fresher than any supermarket or health food product. It’s ready for use when the leaves and stems are brittle. Dried sage will keep its medicinal value for a year if stored in a glass jar away from light and heat. Fresh sage is fine to use also, of course. I usually make up two cups of infusion from the fresh herb and hang the rest up to dry. One cup goes to the fridge for daily use and I freeze the other cup. To keep your gums healthy, swish the infusion around in your mouth for a couple of minutes after brushing your teeth. Gargle and spit it out. Do this twice a day. It’s especially valuable if you do it before going to bed, as you won’t be eating or drinking for several hours afterward. You may want to warm up the infusion, but if you don’t have time for that, cold infusion works too. Apply sage infusion directly to cold sores, pimples, minor skin infections. Dab a cotton swab into the infusion and press it to the skin. 1 spoon and a folded towel or wooden surface on which to place the jar – to prevent cracking. 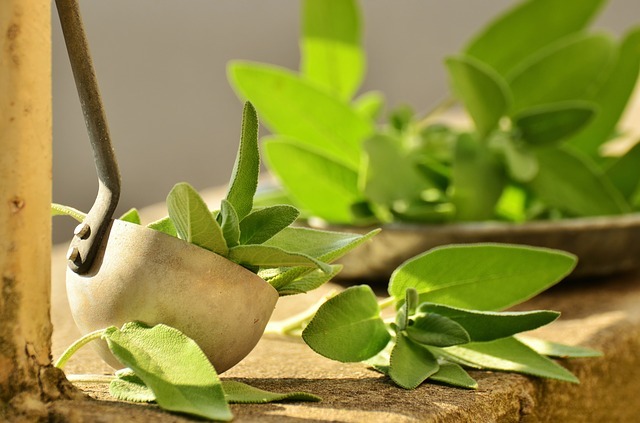 Place the sage leaves in the jar and place it on a folded towel or chopping block. Place the spoon in to reduce the shock of boiling water. Fill the jar with boiling water. Stir the leaves around. Put the lid on. Steep the leaves 4 hours. Keep the strained infusion in the fridge, although you may want to warm up the portion that you intend to gargle with. It will last 2 weeks refrigerated. If it seems like you won’t use it all up, freeze the excess up to 2 months (in an ice cube tray for convenience). Or make half the recipe. Children may gargle with sage infusion (they won’t like it, though). Don’t have them swallow any, as sage mimics estrogen activity and you don’t want anything interfering with their hormones. My own pediatrician permitted my kids to gargle with sage, and their file later showed that they had no colds or flus during the winter they agreed to gargle. And their hormones are fine.